Malena Lott of Buzz Books. Even in a houseful of books, I can never have too many. ou can’t turn in my house without spying a stack of books or clever little bookshelf display. (Just don’t swipe them for dust, please.) Thanks to my handy, dandy iPad, I’ve get plenty of room for ebooks, too. (And no dusting required!) I hope books are on your shopping list this season, and you should probably just add, “read more” on your New Year’s resolution list while you’re at it. My holiday season reading roundup is a literary buffet for all tastes. For the Michael Jackson fans out there, I highly recommend Michael: You Are Not Alone by Jermaine Jackson. There’s something about learning about someone through a sibling’s eyes. It’s written beautifully, and coming from a gal who used to have MJ posters all of my walls, I feel I have the authority to say other MJ lovers will be pleased with this book. Mystery/Suspense: Those ripped-from-the-headlines reads can be juicy and Hank Phillipp Ryan gives us a superb tale in The Other Woman when her reporter heroine tracks down a politician’s mistress and gets herself embroiled in the scandal. Historical: Love Downton Abbey? If so, you might try The Walnut Tree by Charles Todd. The series is set immediately after World War I and the mother/son writing duo deliver a nice whodunit with straightforward prose. A cool treat to read dialogue from a time gone by. “I’ve had several very fine offers for your hand, Elspeth, and I can’t go on putting them off.” Indeed. Women’s fiction: I’m a sucker for Jane Porter. I’ve read every one of her women’s fiction books (she also writes historical romance). Her new series, The Brennan Sisters, is kicked off with The Good Woman. Porter gets women, sisterhood, sticky relationships, and love. Excerpt: “Meg shivered and drew her thin cotton sweater closer to her body as the phrase stupid things women do to mess up their lives echoed in her head.” I’m also a big fan of Jess Riley’s witty, warm voice. Her debut novel, Driving Sideways, was one of my favorites from 2008. Now her second novel, All the Lonely People, is at the top of my to-be-read pile. Recommend adding it to yours, too. My fourth novel, Something New, set in Oklahoma City, came out in November. Thanks to all of you who have purchased it, done reviews and shared it with your friends. Find out more at www.malenalott.com. Also in the Hive, we have the humorous debut novelette, Next Left by Dani Stone, releasing in December about a Kansan returning home for the holidays with a broken heart and a bridesmaid dress. 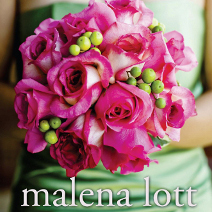 Malena Lott is an author and the executive editor at Buzz Books USA. Her new novel, Something New, is now available in trade paperback and ebook. Connect with her at malenalott.com and buzzbooksusa.com and on Facebook and Twitter @malenalott.